On several occasions I have hinted that my ‘ontology’ seems to be compatible with Buddhist conceptions of space, especially with respect to the concept of the space-particle. Here we will see how this Buddhist space-particle is embedded in a complete cosmology, which significantly differs from the Big Bang theory. First though we have to get a better picture of the fundamental nature of resonance, as it underlies the vibrations of space, the domain of the standing waves, which move, but appear at rest. This paradox of rest and motion is the simplest example of the crucial difference between a field and a wave, which, in my view, Einstein kept confusing, making the ‘wave’ into a ‘thing in itself’ (Ding an sich) as he even defined space as an entity ‘with the property of transporting waves’, which we usually call a medium, but that was taboo in a positivistic ’empty’ space (the aether was the vilified ‘medium concept’ of the ‘logical-positivists’, like Mach). [A source of energy creates a vibrational field by exiting the deep-field through which the energy is carried. This deep-field is the engaged medium through which an influence is sustained, the aether. We have another look at the demise of the aether concept and its consequences. In a very recent scientific quote we can see the confusion ‘relativity’ has caused in scientific thinking and at the same time the proof that the relativity of rotation is still advocated by relativists using an awkward concept of ‘Nothingness’, which I will dwell on later (I could not have imagined a better proof of the theoretical confusion that I claimed exists in ‘Pendulums and Gyroscopes’ just a couple of weeks ago). Don’t be mistaken, there are some very serious conceptual mistakes around, with very big adverse consequences. To show that there are other than Big Bang cosmologies today, and respectable ones at that, we will encounter the Buddhist version in the words of the Dalai Lama and will see how it fits in many ways and very well with what I propose in these pages. An important aspect of my analysis is that it seeks to make space understood as a granular fabric of tiny fields (zero-point fields, singularities?) sustaining a continuous wave-field of transformation and renewal, a state of, what I call , ‘permanent creation’, (this is not a Buddhist concept, as far as I know). My approach may be the first scientific ontology conceptually and mathematically consistent with the concept of a space-particle as this is used in Buddhist ontology, although in no way I would want to suggest that my cosmology is a Buddhist interpretation of space or of its concept of space-particles, but it is conceptually sustained by their analysis. Specifically this model expresses the conditions under which space can ‘condensate’ and ‘materialize’ into material reality, in short, how space (energy) transforms into matter (mass); it is rather more of a metamorphosis it turns out. The Dalai Lama gives the Buddhist alternative to the Big Bang, but also specifies the concept of the ‘space-particle‘ as the enduring (permanent) substance of the universe, which is all the more remarkable because of the all-pervading concept of ‘impermanence’ in Buddhism. This quote sums up what this site is about: replacing the Big Bang theory with a thoroughly different cosmic ontology, which entails finding the nature and potential of the space-particles by means of a thoroughly innovative mathematics of resonance. Space is understood in this cosmology as an aggregate of space-pixalls, called the cosmic deep-field. The pixall (space-particle) itself is a tiny field around a zero-point. The zero-point is a border-point of space, and forms the zero-dimension or ‘Pure Light’. The pixall is reminiscent of the concept of the virtual particle of quantum physics in that the pixall is in a permanent state of spin and transformation, going through all possible shapes it may be called upon to ‘materialize’ into, almost instantly, it is much like the zero-point energy of the so called ‘physical vacuum’ (a contradictio in terminis, by the way). We see that my model is highly compatible with current scientific theories, I only redefine the concepts. Our space-pixall is the 4-D or 5-D version of the pixel of a screen, but versatile and vibrant, it is more potential than virtual, it is embedded in other pixalls like a bubble in foam, rather fixed, but when excited it forms a plane and an axis, it becomes a gyroscopic entity, an inertial field, a (horn-)toroid geometry, like a magnetic field and it can form axial alignments in field lines as do beads on a string, or it can ‘spark’. An excited space-pixall is part of a temporary local field or interaction and ready to ‘condensate’ into material configurations almost instantly. It forms part of the field lines and is thus the ‘body’ of the geometry of space. Uniform motion is a form of inertia, it is embedded in the standing wave field of the inertial fields. One might say that the energy a star exudes is part of its inertial field and of its ‘push’, its permanent pressure, in the universal deep-field. (Mach would have nodded in agreement). This is very visible in the ‘push’ of the Sun in the geometry of the deepfield (Mercury) of the solar system. (see Resonances of the Solar system). So we see that the space-pixall is crucial in the ‘pressure gravity’ of space because it is the ‘substance’ through which the pressure is shaped and carried. This is a quantum description of gravity in geometrical terms. Put for ‘singularity’ the term ‘space-pixall’ and it says what I could not say better, the oscillating field is the ‘cosmic deep-field’. A good description of the classic aether-concept, is given by Max Born, it helps to clarify the difference between ‘Somethingness’ and ‘Nothingness’. We will therefor go back to a ‘pre-relativity’ Maxwell-Lorentz-type aether, in concept, which is a universal rest frame, contrary to relativity principles, all forms of energy are though in motion relative to the stationary deepfield. No object can be called at rest relative to the deepfield, this is crucial. This is one of the main reasons I do have severe doubts about the points of departure of the theory of relativity. It seems to me based on ostensibly logically and empirically untenable postulates (like relativity of rotation which cannot explain gyroscopic inertia). When key foundations of a theory are untenable (like time standing still at speed of light), one wonders what is left to sustain it? Can a final insight ever be right when it is based on the wrong views; it possibly can, but whether it stands in this case, is very much doubted here. I have a book with the above title with key texts of Einstein’s, edited by Stephen Hawking, so we must assume this was a serious assertion by Einstein. But what to think of such intimation that “time” is a “stubbornly persistent illusion”, when there is no one like Einstein who has made time so much into a ‘concrete thing’, a ‘Ding an sich’, so to speak, not to say an ‘idol’, by claiming it bends, curves, slows down, and even stands still and it can keep you: forever young, besides being the fourth rock bottom dimension of reality. It is unclear to me why Einstein could not come to see the electromagnetic fields as expressing the fabric, or even part of the geometry of space, whereas he insisted that the speed of the electromagnetic field (light) is the absolute standard of everything moving and even of time, and in fact, in doing so, created the preferential inertial frame which he theoretically denied exists. The constancy of the speed of the electromagnetic field (not light) is the description of the degree of permittivity of a medium, that is: the description of an aether at rest. Einstein held Maxwell in high esteem and praised the concept of the field proposed by Faraday, but when it came to the electromagnetic field as an expression of the stationary ether Einstein denied the main insight of Maxwell, which was, that the undeniable electro-magnetic wave fields, reaching us from, and stretching into, all corners of the universe, were the sign that there was an ether, that space was full of and constantly filled with new energy, with vibration, instead of being vacuous. The vacuum turned out to be full, it was a plenum. This was groundbreaking news in those days; and curiously still is for many today, 150 years later. Maxwell replaced Newton as the new genius in Physics, but was soon eclipsed by Einstein. The wave field as the carrier of light, proposed by Christian Huygens, was proved by Maxwell, which meant a radical break with Newton’s analysis that energy (light) was corpuscular (particles); it was definitely a wave phenomenon according to Maxwell and just appeared as one aspect of an all pervading universal field that functioned as medium, the ‘luminiferous aether’ (light-carrying ether). As others did, also Maxwell, in the declamation of his major insight, referred to the Creator as the originator of the perceived perfection of Nature. A volte-face with respect to 1905, here definitely asserting an inertial main frame, but still Einstein writes with Infeld in 1938 about ‘a photon traveling through empty space’. You see it travelling, this photon, over billions of years through empty space, tirelessly ‘waving’ along the geodesics, flawlessly on target. (At the end of his life Einstein conceded he still did not know what the photon was, the particle he had ‘created’ himself, but which did not fit his field concept). Eighty years on nobody mentions the ‘ether’ anymore, but the problems have not gone away, possibly just because the concept of a medium was abolished. It triggered a spate of absurd concepts (vacuum energy) of which ‘nothingness’ is the crowning jewel. Here then a quote from a very recent article in a Dutch quality paper (Vk 26/3/11) commemorating the 150 birthday of Maxwell’s equations (it’s Maxwell year!) spoken by a Dutch scientist (prof. Gerard Nienhuis). “The crucial thing about Einstein is that he reasons that the medium is nothingness itself, the empty space. When you let nothingness flow by moving, nothing changes, that is in one sentence the theory of relativity”. We see here that ‘Nothingness’ has become the central concept of relativity theory and this disqualifies the theory as a physical theory, it has become metaphysics ( according to Mach’s positivist principles which were so important to Einstein; Mach did not like relativity theory, thought it too rigid). There is no place for ‘nothingness’ in quantum physics, nor anywhere else in science. I did not know it was this bad conceptually in scientific theory, but it also makes it quite sure that I am right as regards the missing ‘dark matter’ problem due to overlooking rotational inertia. You need only one authoritative scientist talking obvious nonsense, to expose the state of confusion in theoretical physics today. What one half calls empty, the other half calls full and with it a century of critical language philosophy has gone down the drain; I think that is pretty serious. Since scientists miss 95 percent of the energy (mass) of the universe, this means in fact missing 95 percent of the inertia and this means obviously not understanding what is going on. Since I have shown in the analysis of the solar system that the big picture of inertia is a standing wave-field of resonance in which the numbers 9 and 18 play a decisive role, we can conclude that the scientific approach to ‘gravity’ completely misses the point, the whole concept is wrong, since it overlooks rotation, the key to inertia and the toroidal geometry of space. Rotation is possibly a better candidate for the 4th dimension of space and when we add another perpendicular rotation as the 5th dimension (two cycles form a time frame), then we have a torus and probably all we need to describe is the geometry of space and of the space-pixall. The big picture of the universe is just this overwhelming immobility, what once was called ‘the fixed stars’, the firmament. It is a cumulative inertia of ever greater cosmic structures frozen in space, which creates the ever deeper gravity wells that telescopes probe. The missing inertia (wrongly called ‘dark matter) has been visible for years in the redshifts. In general the more energy (mass) is involved in a system the deeper the dominance of its inertial field. The moon follows the earth; the earth, the sun; the solar system, the local area; then the Milky Way, the Local Group and so on, with ever bigger scales, ever slower cycles, ever greater time-spans, ever greater inertia. Whatever the scale, the energy fields are with us now, their sources may even be gone, but their presence, the stability of their fields, is here with us now, we can see that, this is how the past pervades the present through the energy of space and why time does not exist. What is gone cannot be changed, but cannot be taken away either. What we see around us is here from an unfathomable deep past. The unchangeable past gives the present its stability and its future, it does not move. The inertia of the past is the ‘rest-frame’ of the present. The past cannot be taken away because everything springs from it constantly. This is why the truth is bound to surface and information does not get lost, as it becomes the base of the future. It may be seen as close to the law of Karma of Eastern philosophy. What we can conclude from this is that the further away and farther back, we go, the stronger the accumulated inertial fields, but this is just relative to our position. So the further away the stars or galaxies the more inertial field, or spatial curvature, there is in between us, which determines the amount of redshift. The deeper space is probed, the deeper the ‘gravity well’ that comes with it and the more the wave-field will be stretched into the red, will be red-shifted. The ‘gravity-well’ is the clearest and simplest explanation for the cosmic redshift because light undergoes a gravitational redshift when coming forward from a relatively stronger gravity field, ‘climbing up the gravity-well’, as it is called. We see here how this interpretation of the redshift, which is simpler and providing a more straightforward insight (Occam’s razor), how this interpretation completely undermines the most solid pillar of the Big Bang cosmology, the redshift as evidence of the receding light sources (stars), which would point at the expansion of the universe. This conclusion generated the ‘logic’ that this expansion must have had a beginning, so that it can be traced and contracted back in time until we arrive at a singularity, a point without dimension. 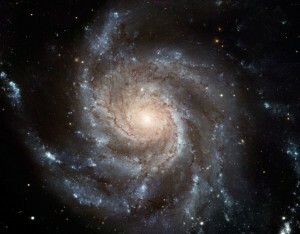 That is where everything is coming from, the primordial bang of that original singularity, that point without dimension. (Can you imagine? Where did the energy come from?). Isn’t that indeed an awesomely straightforward logic from our scientists, very, very clever! But the truth is as with dark energy: it is an optical illusion, a misinterpretation of the data. Anyhow everyone was elated, at last we had found the answer, because we had found the beginning of everything, now we had our own solid scientific story of creation. Mind you, scientific, no vague religious nonsense, or stories with turtles; here was a true identifiable beginning……, at last: the BANG, about 14 billion years ago. How we crave for beginnings and ends. There must be a beginning of the universe we feel, but now that we have got it, like children, we ask: and what was there before the Bang? These guys have all the answers! But it doesn’t add up. The redshift is no argument for dynamic space expansion, but possibly a very good argument (and measure, maybe) for all the inertia (or is it ‘curvature’?) science is still missing, the ‘Dark matter’. The question of Dark matter is supposed to be that of ‘the missing mass’, but in fact it is the ‘unexplained inertia’ of all the individual stars, of their systems and of other objects that act as inertial gyroscopes. These rotating bodies are sustained by, but at the same time, sustain, the cosmic inertial deep-field, because they, with their inertial reflection fields, so to speak, add their ‘rest-momentum’ to the stability of the whole. By being in perpetual uniform motion the body with its reflection field ‘con-firms’ the stability of the deep-field and in that sense is conform Mach’s principle. The reflection field expresses the presence of the body in the deep field, which is accordingly ‘curved’ (moulded) in its geometry by the body’s reflection, the inertia. The inertial stability of the solar system is rooted outside the system, the stability of all cosmic systems, is rooted in the individual inertial fields of the components in the deep-field of inertial space. If there were no preferential inertial rest frame how could there be uniform motion or parallel motion, like waves? It is the medium that conditions the transfer/movement of energy. It is the absolute spinning movement (the gyroscope again), relative to the whole which creates the inertial field of the object with its deep-field geometry, whether it be an electron, a star or a galaxy. The stability of the solar system is rooted in the inertial stability of each of its constituent bodies with respect to the whole universe. It is this basic individual stability with respect to the whole, which makes orderly interaction between bodies in a system possible. 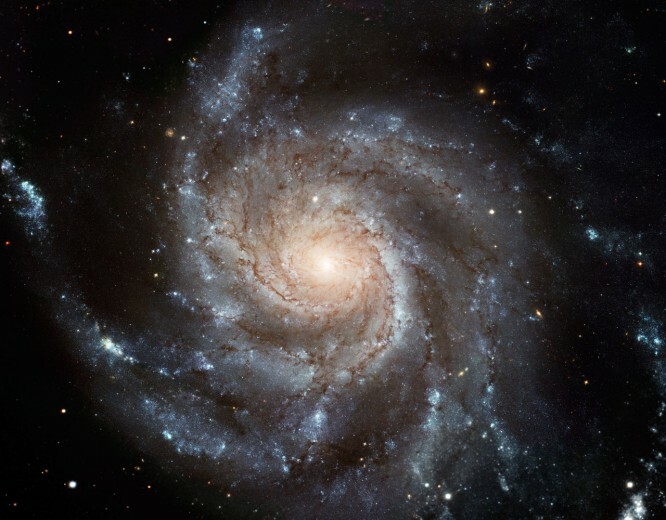 Even a galaxy is a rotating inertial system, of which we can only discern the internal stress by the ‘torsion’ of its appearance as you have seen in all those magnificent pictures of spiral galaxies in outer space, that is the frozen relativity of time. There is no chaos there and nobody doubts there is rotation and a vortex (black hole) involved, but the problem of dark matter is the different time scales and, of course, that is: the relative inertia. So far I have put forward a Buddhist and a Buddhist-inspired alternative to the Big Bang cosmology and suddenly you have a choice where you may have thought there was none, the choice between the BigBang cosmology of Big Science and the cyclic Buddhist universe, or some unfinished emerging contemporary cosmology like mine. The Buddhist cosmology of four stages mentioned earlier does not really reflect the attitude of the Buddha himself towards cosmological questions, but is a doctrinal development picture in the spirit of the four-fold truth of suffering. In general the Buddha actually refused to answer questions about ‘how the world originated’ and other metaphysics, he even compared such questioner in a famous parable to: a man wounded by an arrow who first insists to know who shot the arrow and why, before removing it; he would die before he had the answers. We all carry the arrow of death. We are urged to act here and now so we can remove the arrow and live beyond death. That seems the mystic message of the Buddha’s personal cosmology. I found a welcome addition to my arguments in Freeman Dyson’s “Why is Maxwell’s Theory so hard to understand?”; a short essay on vortexes which suits us very well here.